Walking distance to Plaza de Armas – Main Square. A quite place despite the noise of the city. A family-run operation with a welcoming disposition. We make our best to offer you a memorable stay. Stay in an environmentally friendly establishment. Nativa is a family-run hotel establishment. We strive to create a warm and welcoming environment for our guest. Our attentive staff is always ready to assist you with any questions you may have about our services or about Iquitos city. We are centrally located and in walking distance from the Main Square, restaurants, stores and from the Boulevard. Nativa offers you room spacious with AC, comfortable, full equipment. A quiet place to stay and rest, ideal travelers bussiness and tourist who look for the best service. We have a 24 hr front desk and security and Free storage luggage. Iquitos also known as the Gateway to the Amazon, is the largest city in the Peruvian rainforest region. We'll make sure that the city tour or the jungle lodge of your choice will be an adventurous experience. Tips and recommendations for tourists to make your stay in Iquitos safer and more enjoyable. “I’ve stayed at Nativa for most of 6 months now, and I could not recommend Nativa and the family and staff that run it more. The hotel is comfortable and clean, and the rooms are spacious. Monica, ​and the stuff ​are incredibly hospitable and resourceful. There isn’t a question about Iquitos she doesn’t know the answer to (or at least she’ll know someone who does). The hotel is a family-run business, and I consider the staff my Peruvian family (for example, I cooked Thanksgiving meal for them, and Monica’s mom is always concerned whether I’m eating enough). Monica has been nice enough to let me use their kitchen to cook breakfast and dinner most days. 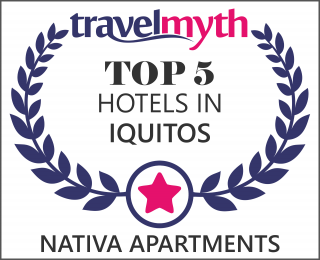 So if you plan to come to Iquitos for a few days or a few months, without a question stay at Nativa!